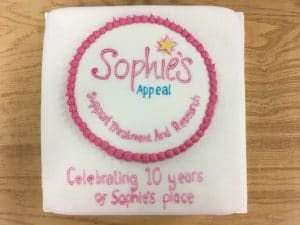 A fabulous afternoon celebrating 10 years of the opening of Sophie’s Place, and presenting a plaque. Sophie’s Appeal have funded many projects at Northbrook Ward, RHCH, Winchester over the years and it was lovely to show off the fantastic artwork recently finished and lovingly done by Kelly Griffiths from Kiddies Heaven. We wanted to mark the occasion with a plaque as a reminder of all that you guys do in supporting and donating, making our work possible. We’d like to thank the staff for helping organise the celebration and those that turned up to help Lin celebrate her birthday on such a special day. Thank you to Carly Deborah Jarman for making such a gorgeous cake.